There was a time when "cheats" were synonymous with videogames. Whether skipping levels or granting invincibility, cheat codes and "Easter eggs" were a developer's way of allowing legitimate access to locked content. They were a core part of their designs. Now the Konami code is all but forgotten and the few remaining cheats exist to enhance a game after completion rather than aid you in getting there. 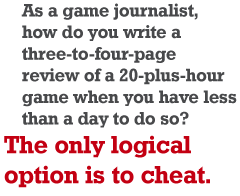 But there's one rather unlikely corner of the gaming space where cheating still runs rampant: games journalism. It's partly the outcome of a gradual shift in game design philosophy over the last 25 years. Today's games are less interested in short, difficult stages that need repeated playing to master. Instead, they're increasingly turning to mechanics like regenerating health, convenient checkpoints and quick-saving to make sure players don't become frustrated. (See previous Escapist features "Save Our Souls" and "Killjoy" for more on that subject.) In short, you don't really need to cheat anymore. To counter this loss of repetition, games have become both longer and more varied. That's where the problems begin: As a game journalist, how do you write a three-to-four-page review of a 20-plus-hour game when you have less than a day to do so? The only logical option is to cheat. Before resigning in early 2007, I was employed for six months in-house at one of the U.K.'s biggest publishers of print games magazines. Prior to that, I had been an external freelancer, witnessing two publisher bankruptcies. During my time in-house, magazine deadlines were scheduled around allotments of four weeks, by the end of which the entire magazine had to be at the printers. Games, therefore, were normally reviewed in the issue published just prior to their scheduled release. Along with playing the games I reviewed, I was expected to write between six to eight pages (roughly 4,000 to 5,000 words) of copy per week. Due to understaffing this was frequently more, and on one occasion when I divided my monthly paycheck over the average number of hours I worked, I found I had earned less than the minimum wage. This isn't uncommon among British gaming publications. To alleviate understaffing, publishers allow their writers to freelance for other internal magazines. It's cheaper than hiring extra staff or external freelancers, and it also boosts an internal writer's wage without allowing them to seek writing opportunities outside the company. It's an ingeniously Machiavellian set-up, but one byproduct of this is that internal freelance deadlines are extremely short. Few writers, however, can afford to turn down the extra work.